Checked on the nest box just after 6AM this morning under fair skies, wind from west at 9MPH, and temp at 31F. The forecast for today calls for mostly cloudy skies, with a high near 47. Light and variable winds becoming south 5 to 9 mph in the afternoon. For tonight, rain and snow likely before 1am, then rain. Low around 36. South wind 6 to 8 mph. Little or no snow accumulation expected. After waiting almost an hour for a look this morning, the adults had a shift change at 6:53AM and this provided a quick peek at the 4th egg! This egg was likely laid at some point overnight. Had kept a close eye early evening last night and had a clear sighting of just 3 eggs just before sunset, with little egg laying movement seen up until dark settled in. So now, the Peregrines shift into full and shared incubation duties that will last the next 30 days or so! We are about a week ahead of last year’s egg laying time frame. With God’s grace the circle of life continues! 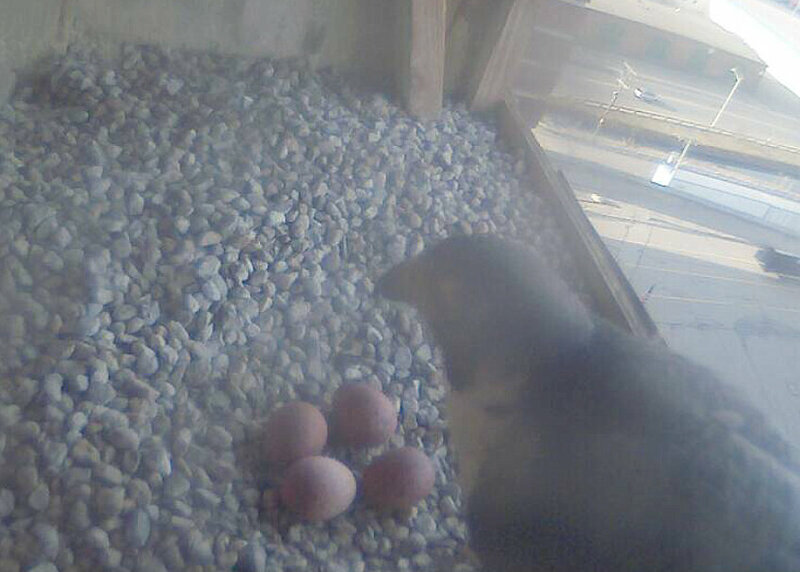 ← Lawrence Peregrines: Egg #3!